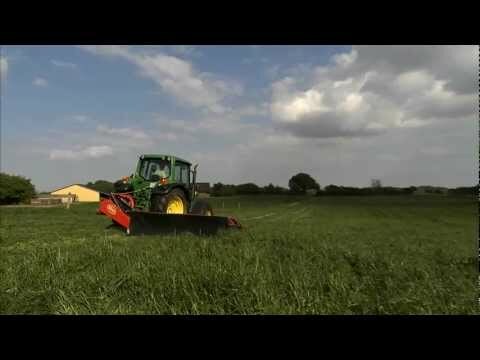 Side mounted plain Vicon disc mowers with working angles of up to 35°. The Vicon EXTRA 200 models are lightweight, simple mowers with a compact but durable design, for maximum output at a competitive price.They are offered in working widths 2.80m and 3.20m. Featuring the EXTRA cutterbar with triangular discs, continuous and excellent cutting performance, especially in difficult crop conditions, is ensured. Vicon EXTRA 228 and 232 offers a very flexible suspension giving perfect ground contour following. This ensures that the mower is able to adapt to extremely uneven field conditions, giving the best mowing result. The linkage of EXTRA 228 and 232 ensures that the mower is capable of working on steep angles or in hilly conditions. To offer maximum protection of the cutterbar, these machines are fitted with the well-known Vicon BreakAway solution.